Influence marketing vs. celebrity endorsement – What is the difference? 60 Minutes recently aired a segment on influencer marketing, which highlighted how many of the latest celebrities are social media personalities. Utilizing various social platforms, many of these individuals have been able to attract more eyeballs than primetime television shows. Because of this, brands are paying these individuals to promote their products through what has been dubbed “influencer marketing.” The fact that the 60 Minutes segment also highlighted Kim Kardashian makes me question if they really understand influencer marketing, largely because the line between influencer marketing and celebrity endorsement is extremely blurry. If we look at the definitions of each on Wikipedia, influencer marketing places the focus on a key individual rather than the market as a whole, and with celebrity endorsements or celebrity branding, is about using a person’s social status or fame to promote a product. These definitions are almost identical, with the exception that celebrity places an emphasis on fame or social status and promotion. Judging by the following that some of these social media stars have, they could easily be considered famous. It is hard to argue that Kim Kardashian is not famous, and these “influencers” are being paid to promote products. So what is the difference? 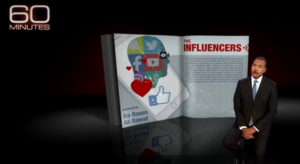 3) The influencer controls the message. Diving into the first of the three criteria, the well-known individual needs to be viewed as an expert in the product area being promoted. The example given in the article states, “Michael Jordan doesn’t need to be a fashion expert to recommend Hanes,” but I would argue he did need to be a basketball expert to sell his basketball sneaker. The second part of the execution has to do with being engaged in the community and allowing for a two-way communication. So, if the various social media platforms were around at the height of Michael Jordan’s career, and he used them to promote his sneakers and engage with fans, he would be considered an influencer. The third is where I believe the difference really lies. In an influencer approach, the brand turns over pretty much all control of the message. It lets the influencer create a message that they themselves want to share. The influencers will share the good and the bad, which gives the message a sense of authenticity and credibility. If the brand creates a scripted message that a well-known individual pushes out, it is simply an endorsement. Continuing with the Michael Jordan example, this is where it falls short. Nike controlled every aspect of the messaging around the sneaker, so even if he was pushing the message out through social channels, it would be brand-scripted. Going back to the 60 Minutes segment that I questioned because it highlighted Kim Kardashian, if we bounce some of the recent things Kim Kardashian has promoted against the same three criteria, we will see that it fails to be classified as influencer marketing. While she certainly is heavily engaged in the community she built, I would argue she is not an expert in many of the things she promotes, the exception being fashion. A person also has to question if she is always creating the message herself or if brands are scripting it for her. In either case, if all three criteria are not met then it is simply a celebrity endorsement.